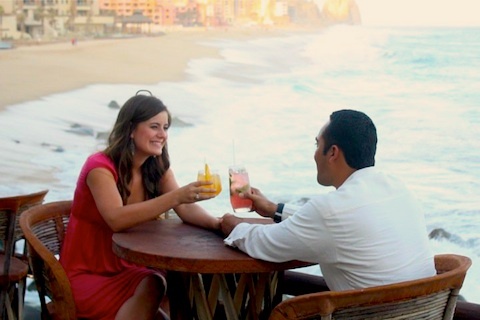 Maybe you and your loved one have the plane tickets booked and are looking for a romantic dinner in Cabo. Or maybe you are still looking for a fantastic place to stay Valentine’s Day Weekend. Whatever it is, there are plenty of places to celebrate your love in Cabo. Whether you have booked your hotel or not, here are some ideas of places to check for special Valentine’s deals, menus and parties. Check with your hotel before booking if they are offering any special deals. Most hotels in Cabo have packages that include champagne, chocolates and more. Some even offer free nights if you are staying more than one night. With One&Only Palmilla’s Winter Valentine’s Package you receive one complimentary night when staying two consecutive nights plus complimentary champagne, flowers, truffles, in-room espresso and tea service and daily fresh fruit. To top it off, it includes a Valentine’s dinner created by a celebrity chef. Call 888-205-1463 to book. Capella Pedregal’s Escape to Romance Package, which is bookable the entire month of February, includes 4 nights of accommodations (the fourth night is free), transfer to and from the airport and resort, a bottle of champagne and canapés upon arrival, and dinner at the El Farallón Ocean Side Terrace. The package also includes a specially prepared bubble bath scheduled at your request. Call (877) 247- 6688 for more information. Spas often have specials for couples around the Valentine’s Day holiday. You’ll find savings on everything from couple’s massages to rituals to massages on the beach. The Armonia Spa at Pueblo Bonito Pacifica offers a Couple’s package including a Temazcal ritual and Citrus Supreme for $532 (that’s $228 of savings). The Pure Spa and Pilates Studio at the Shoppes at Palmilla is offering a “Double happiness” Swedish couple massage with exotic Pindas. Enjoy your treatment with rose petals and sparkling wine under the warm lights of scented candles. Cost: $1,500 pesos. Looking for a special dinner on Valentine’s Day? Manuel’s Creative Cuisine offers a delicious multi-course meal full of delicious food. Entree choices of braised rib or chicken mole. $575 pesos per person. (about $48 USD) View Menu. Call (624) 144-6171 for reservations. Sunset da Mona Lisa is offering Valentine’s Day dinner with ocean view table, live music, and a complimentary cocktail. Cost: $85+. Call (624) 145-8160 to book. Save 30% off of airport transportation with Victor’s Cabo. Mention the Valentine’s Day special. At Pepita Boutique, Everything Red is 20% off and 10 % off heart jewelry. Perfect for a Valentine’s Day dress.